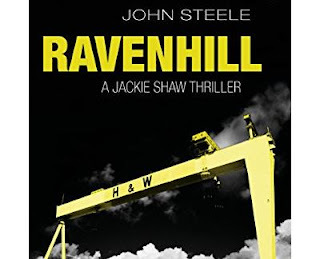 John Steele's debut novel Ravenhill is a thriller set in his home town of Belfast. It is the first book in a series featuring Jackie Shaw, and has been described by Tony Parsons as "a taut, intelligent thriller that ranks as the best Belfast thriller since Harry's Game by Gerald Seymour". 1993: Jackie Shaw is a young tearaway running with paramilitaries in Belfast, keeping psychotic hard-man Rab Simpson in check while sleeping with gang leader Billy Tyrie’s beautiful wife. When a bomb claims nine lives, he becomes the getaway driver in a planned reprisal killing. But Jackie may not be who he seems. After disappearing in mysterious circumstances, he returns to Belfast 20 years later for his father’s funeral. When figures from his past emerge, he is left with no choice but to revisit his violent former life. John Steele was born and grew up in Belfast, travelled to the US in 1995 when he was 22, and has since worked and lived on three continents, including a 13-year spell in Japan. He has been a rock drummer, illustrator, truck driver and English teacher. He now lives in England with his family.